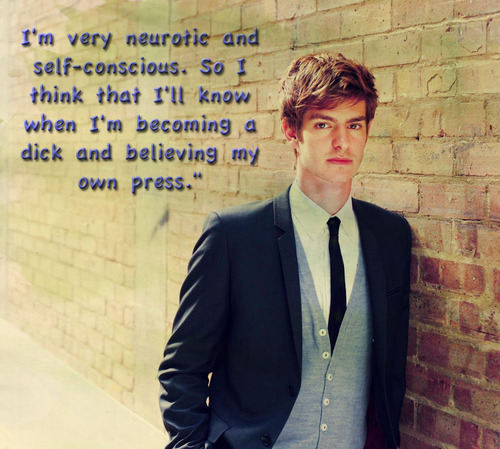 See the gallery for quotes by Andrew Garfield. You can to use those 8 images of quotes as a desktop wallpapers. I don't believe anyone is ugly. 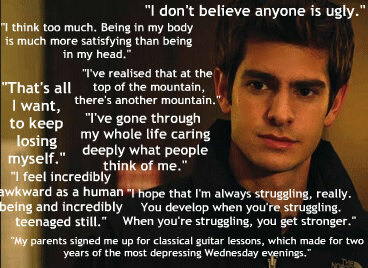 As an adolescent, Spider-Man was what got me through tough times in terms of being a skinny kid. I feel incredibly awkward as a human being and incredibly teenaged still. I think too much. Being in my body is much more satisfying than being in my head. I've gone through my whole life caring deeply what people think of me. I've realised that at the top of the mountain, there's another mountain. My parents signed me up for classical guitar lessons, which made for two years of the most depressing Wednesday evenings. Spider-Man has always been a symbol of goodness and doing the right thing and looking after your fellow man. That's all I want, to keep losing myself. I just think I've always been sensitive and had difficulty containing my feelings, and I've always searched for outlets for that, because otherwise those feelings come out in chaotic ways that aren't always great. In secondary school I was floating - I wasn't passionate about anything. I did a little sport, but it was pretty joyless because the competitiveness was too much to bear. Obviously there's something very seductive about movies, which can be attractive in a bad way if you're doing them for the wrong reasons - for money, or for fame.